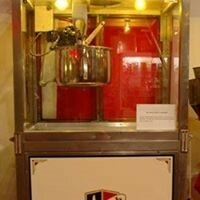 ﻿ Wyandot Popcorn Museum - Ohio. Find It Here. Come to the circus! Under a colorful circus tent inside Heritage Hall is the largest, most impressive collection of popcorn wagons and peanut roasters in the United States. The perfect setting for the Wyandot Popcorn Museum. These priceless wagons date back as far as the turn of the century and have been restored to their original condition. Actor Paul Newman's antique popcorn wagon, which sat in New York City's Central Park, is also on display at the museum. All of the classic antique poppers are here - Cretors, Dunbar, Kingery, Holcomb & Hoke, Cracker Jack, Long-Eakin, Excel and more. Even a few homemade one-of-a-kind antiques. Wyandot museum craftsmen have done the restorations so well you will think they were built yesterday. Two are 100 years old. Many cases they knew the original owners and the selling price.